Badminton can be played by young and old alike and is a good way to exercise and keep fit, but to play the game you do need to have a certain level of basic fitness. If you are overweight, or haven't exercised for a while you should get yourself into a reasonable condition before attempting to participate in the sport on a regular basis. It's an ideal sport for the family to play together and provides a great aerobic workout. During a normal two match game a player can expect to run around a mile in distance. Quick reflexes, anticipation and good hand eye coordination are all needed to play the game well. Compared to other sports Badminton is relatively low risk when it comes to injuries, but they do happen, and can be minimised if know what they are and how to avoid them. 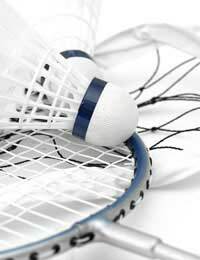 Eye Injuries - Although the number of eye injuries in badminton are not as high as in other racquet sports like squash, they do tend to be more serious. Around 70 percent of all eye injuries take place during doubles matches. The person most at risk is the player who is nearest the net when their partner is serving. They either get hit with the shuttlecock straight in the eye by the opponent returning the serve, or take a blow from their partners racquet while trying to retrieve a shot. The shuttlecock may look harmless but during a game it can travel at speeds of over 130mph and because of it's shape can fit directly into the orbit of the eye(unlike a squash ball) and cause serious eye injury. Tennis Elbow - This can be caused by gripping the racquet too tightly, combined with a lack of strength in the forearm muscles. Racquets that are too tightly strung or too light are also thought to be a contributing factor in causing inflammation of the elbow. Knee Injuries - Wearing incorrect footwear can be a contributing factor in getting a knee injury while playing. Learning proper lunging techniques, and doing exercises to strengthen your knees, can also help prevent your knees aching and injuries occurring. Ankle Injuries - Sprains and twists of the ankles are quite common, but normally don't result in any serious long term injury. If you have suffered from recurring ankle injury, then support (strapping) is advised before playing a match. The risk of injury can be reduced or avoided by proper preparation. A lack of technique, lack of flexibility, insufficient strength, wrong equipment, lack of a warm up and overuse are the main reasons for badminton injuries. The correct type of shoes should be worn. While playing badminton you need to be able to change direction quickly and lunge and stretch to play low shots. To be able to do this you need shoes that will slide on the surface. If you wear trainers or basketball shoes on court, you can guarantee that you will eventually do some damage to your knees or ankles. For a beginner tennis shoes are probably a better option than badminton shoes as they provide a bit more support to the arch of the foot and don't slide quite as much on the surface. Before starting a game you should have a proper warm up. There's lot's of twisting, turning and stretching movements during a game and if the muscles are warm and flexible before a game starts, the risk of injury is reduced. If you're a beginner don't play too often or for too long. There's a tendency for novices to pick up injuries by trying to do too much too soon. More experienced players have a tendency to play too often as well, but they are also inclined to ignore niggling little injuries and try and play through them, with the result that they end up doing more damage and pick up a more serious injury. It's worthwhile finding out the proper way to play certain shots, how to hold a racquet correctly (to avoid wrist injuries), and the best way to improve your footwork and get around the court easier. The easiest way to do this is to book one or two lessons with a trainer or instructor, who will advise you on correct technique and fitness tips.